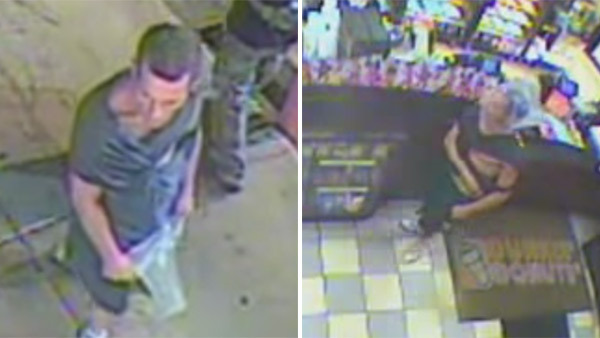 PHILADELPHIA -- Philadelphia police are looking for an armed robbery suspect who tried, and failed, to disguise himself with a clear plastic bag. Surveillance cameras captured the suspect pacing around outside the Dunkin Donuts on the 300 block of Oregon Avenue back on July 6th. After a few minutes, the man decided to strike. He placed the transparent bag over his head and made a beeline for the counter. After hopping over it, the robber pulled out a knife and grabbed a box containing cash. The suspect then lost the plastic disguise while trying to escape. If you recognize the man behind the clear cover-up, call the South Detective Division at 215-686-3013/3014.